Egia is a lively place: new cultural and artistic spaces have recently be opened, such as Tabakalera, La Farándula, Dabadaba... And it also retains many neighborhood activities, popular celebrations ("Porrontxoak"), wide nature spaces, and its working-class, non-conformist character, with grey buildings, local commerce, down-to-earth taverns, ramshackle locations and bars from all walks of life: not pretentious places, but places where you know that you’ll eat and drink well, and for a reasonable price. InnovArt art gallery and studio. ”Sahara 40 Years of Exile” graffiti. If you come to Egia from the city centre, or from the bus/train station, you’ll see that just next to this is the Pórtico de la Estación del Norte (“North Station Portico”) (1906), locally known as the “Brandenburg Gate”. In the future this will be the entry point for AVE trains. From the “Brandenburg Gate”, passing the tunnel, you will see the entrance to Tabakalera, the former tobacco factory. It’s interesting to note that in the 1920s many of the workers at the factory were female, which means that there were a lot of independent women who earned their own money. So you can see that Donostia was a forward-looking place even in the 1920s! A symbol of the belle époque, these women had a very social lifestyle, going to races, playing sport, going to parties and so on! Relaxing at Cristina Enea Park, in front of the Tabakalera. Check the programme at Tabakalera in advance… there’s probably something of your interest! And if not, go in anyway, and let yourself be blown away by its different rooms: you have 37,000m² to explore! And don't forget to go up to the 4th floor terrace for a totally different perspective of the city! The Tabakalera building still has its original staircase, which used to be the main entrance to the factory, providing access to the different spaces. Tabakalera Terrace on the 4th floor. Photo @olga_grande. After you leave Tabakalera, you can have a lovely stroll through Parque Cristina- Enea, a beautiful park with a total area of almost 100,000m2. The gorgeous gardens were designed by Pierre Ducasse: it’s no surprise he was also the gardener for the Royal Family! The Dukes of Mandas were the Donostia resident Fermín Lasala y Collado and the Italian Cristina Brunetti, Duchess of Mandas and Villanueva. Fermín and his father were highly influential public figures who travelled frequently because of their work, so it's also no coincidence that the train station is located just by the Cristina Enea Park. Swans and peacocks at Cristina Enea Park. The park was called Cristina Enea in honour of Cristina Brunetti. Enea in euskera (basque) is a suffix which is traditionally used in the names of houses and palaces. You’ll recognise the name of the official lehendakari (“President’s”) residence, Ajuria “Enea”, right? Well, the name comes from the Ajuria family, who originally constructed the palace. If you're hungry after walking through the park, don't worry, because you're right by one of the bar areas. If you want to round off the day in an alternative way, Egia is the place for you! In the afternoon and evening, I'd recommend you see a micro-theatre production at La Farándula and have a drink at their bar, where you can rub shoulders with artists. It has 3 halls and offers 15-minute performances in an intimate atmosphere - with no more than 20 spectators per hall! Cafe-theatre El Andén. Photo @elandencafeteatro. Rock Concert at Le Bukowski. Photo @alaincazenave. I'd also recommend checking the schedule of concerts and parties at Gazteszena and El Andén.And, for those with real stamina, when everything else has closed you can still go to Cactus, the most “underground” spot. And if it’s Friday... Don't miss the pintxopote the tradition of going out for drinks and eating tapas in the bars of Egia! One drink and one tapa for €2, in a guaranteed great atmosphere. You can find more information about the neighborhood and its artists/cultural groups on the website of the book "To Auzoa/ Toma Barrio". 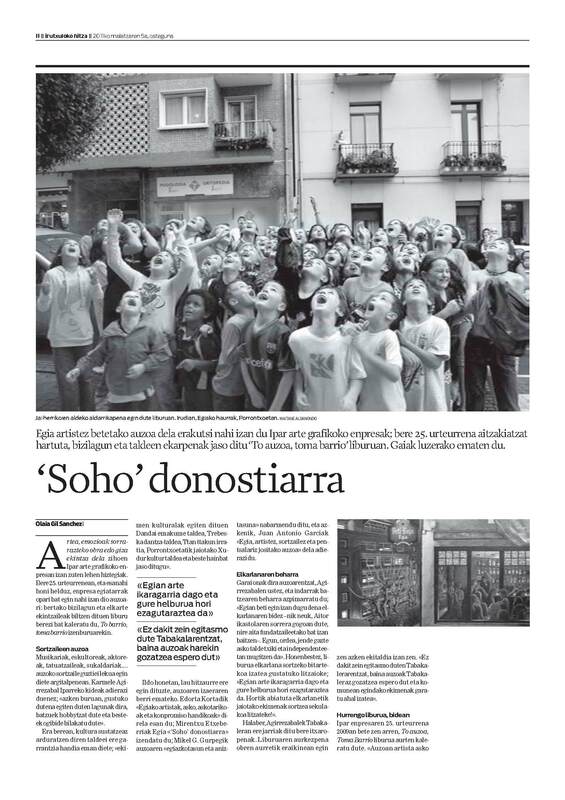 82 artists who live or work in the neighborhood participated in the book (of more than 200 located), and Egia is described as "Soho Donostiarra" in its prologue. In front of Donostia bus station you will see the Pórtico de la Estación del Norte (“North Station Portal”), the future entry point for high speed trains. Locally known as “The Brandenburg Gate", it was built in 1906 to facilitate the passage of incoming and outgoing passengers from the Estación del Norte (1864), next to the María Cristina bridge which was opened one year later. The portico was dismantled to build Donostia bus station and it is being rebuilt to turn it into a future access point for the AVE trains. It experienced its golden years as a tobacco factory in the 1920s. More than 100 people were working there in 1925, nearly all of whom were women. San Sebastián was an extremely open city in the 1920s and as many women worked in the factory and earned their own money, this gave them a certain level of independence. Nowadays Tabakalera has an area of 37,000m2 which is used for cultural and arts activities: exhibitions, cinema screenings with discussions, workshops, presentations, micro-theatre performances, a citizen laboratory (Hirikilabs) and a creative library (Ubik) and more. Located in a bend of the Urumea river, Cristina Enea Park is a public park with an area of 95,000m2 which was granted to the city by the Duke and Duchess of Mandas. It was once the residence of Fermín Lasala y Collado - an extremely influential Donostian man who, among many other roles, was once appointed as an ambassador in Paris and was President of the Council of State - and the Italian Cristina Brunetti, the Duchess of Mandas and Villanueva. The park was named “Cristina Enea” in honour of Cristina Brunetti, and the Duke and Duchess granted the park to the city provided that a number of criteria were met: among others, that that the name “Cristina Enea” must never be changed, that the park should only be used for public strolling (ruling out ball games, football, drinking, playing bowls and horse riding) and that the portrait of the Duchess must be placed in a prominent place. The magnificent gardens were designed by Pierre Ducasse, a gardener for the Royal Family, and the construction of the palace was overseen by José Clemente de Osinalde who combined elements of traditional Basque architecture with the styles of that era. The Farándula Microteatro has 3 halls and provides 15-minute theatre performances for a maximum of 20 spectators. A new performance begins every 10 minutes, and spectators can await the next performance in a bar-restaurant in which they can enjoy a varied menu and rub shoulders with artists. From Thursday to Sunday. Afternoon session (10.30-21.50) and evening session (22:30- 00.20). *If you know other bars that offer pintxopote in Egia, it would be great if you could tell us in the comments section so that we can add them. Mila esker! !